Two Keyence LJ-G series 2D laser displacement sensors were used to measure the step change between two surfaces of a metal/graphite bar assembly. 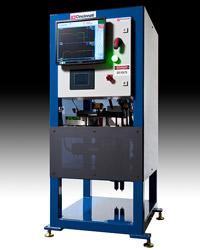 The laser controller could also be programmed to measure gap width, intersection angle and surface flatness. The laser sensors were mounted above a walking beam assembly that moved parts into the gaging machine every 2 seconds. Part resistance was automatically checked using precision touch probes. Bars that passed gaging and resistance checks were advanced out of the machine down a good parts chute. Failed bars were pushed offline into a reject bin contained inside of the cabinet. Pass/fail results were displayed on the HMI and output to customer's PC. All components were housed inside of a tubular steel frame cabinet with cover panel guarding.